TEDxXIMB, the flagship annual event of IlluminatiX – The Media & PR Cell of XIMB, and an independent TED event is once again back with its fifth edition. For TEDxXIMB 5.0, the theme chosen is Chakravyuh, the inescapable formation. Chakravyuh [Chakra – Wheel, Vyuh – Puzzle] is an ancient war tactic which was used in the Indian epic Mahabharata by Dronacharya on the 13th day of the Great War. As the name suggests, it’s a rotating helix of soldiers making up seven layers of the maze, where each level gets stronger as you move closer to the center. Unlike the Greek phalanx system, which is analogous to a battering ram, the Chakravyuh exhausts its target both physically and mentally with its deceptively simple opening. While Chakravyuh might be another ingenious war tactic buried deep within the pages of history, the concept transcends the realms of warfare. Be it the drug crisis that has affected teenagers all around the globe, or, the rise of extremism in recent years, everything can be linked to the formation of Chakravyuh, where individuals are trapped in the nigh-invincible rotating helix of hedonism, prurience, intoxication, and ultimately, despair. To combat this crisis which has trapped most of us in an inescapable abyss, we need to find the shining light at the end of the tunnel. Where does it come from? Well, from the individuals who have managed to escape this vortex with their sheer will and steely grit. For the fifth edition of TEDxXIMB, we have a list of eminent speakers who have won against overwhelming odds to leave a mark on the world, and possibly, make it a better place too. The first speaker who shall be gracing the stage is Lt. Gen. Satish Dua, former Chief of Integrated Defence Staff to the Chairman, Chiefs of Staff Committee (CISC), which is responsible for fostering coordination amongst all three services of the armed forces. As a counter-terrorism specialist, he was instrumental in planning the surgical strikes in response to the terror attacks at Uri. His years of experience as an infantryman, leader, and a strategist who has accomplished tasks under extreme duress makes him a perfect speaker who can communicate to the masses about the importance of focus, adaptability, and perseverance to fight the daily adversities of life. The second speaker is Sruti Mohapatra, a differently-abled individual who is an inspiration for all. Her stellar career in the Indian Civil Services ended abruptly when she met with a near fatal accident. The accident left her paralysed, and ultimately ended her marriage, alongside with her career in the Indian Civil Services. Despite such odds against her favour, she became a crusader for equal rights for the differently-abled. Her journey so far has not been an easy path, and still, she has won numerous accolades from national and international agencies for her relentless crusade. The third speaker for this event is Divyanshu Damani, a positivist and a social media influencer at the young age of 22. His consistent output of positive content aimed at the youth has been well appreciated and helped numerous individuals to find their true calling and subsequently excel at it too. The fourth speaker is Megha Vishwanath, the face of CNBC-TV 18’s flagship shows ‘Young Turks’ and ‘Tech Toyz’ is an avid technology enthusiast who regularly connects with the current generation. Her ability to connect with the current socially reclusive generation makes her a flawless model for the topic at hand. For the event, the fifth speaker is A.L. Jagannath, an eminent marketer who has featured in top marketers list. An alumnus of XIM, Bhubaneswar and M.I.T. Sloan School of Management, he currently leads the Dell-EMC Synergy and Alliance role for VMware. His passion for education for the underprivileged and his association with various NGOs makes him a role model for everyone. The sixth speaker of the event is Sachin Das Burma, the brain behind timeless ads like ‘AamSutra’, ‘Thinking is such a waste of time’, ‘Straighten Up’, and numerous other avant-garde ads which brings together aesthetics and marketing. He recently spearheaded the advertising campaign for Odisha Men’s Hockey World Cup 2018 held in Bhubaneswar. The seventh and the final speaker of the event is Paul Walsh, who is the founder of ‘The Jungle Crows’. The Jungle Crows was initially founded for the shared love of rugby which subsequently became a platform for uplifting underprivileged communities. Paul Walsh has been featured in the GQ Magazine and has also received MBE on UK’s Honour List. 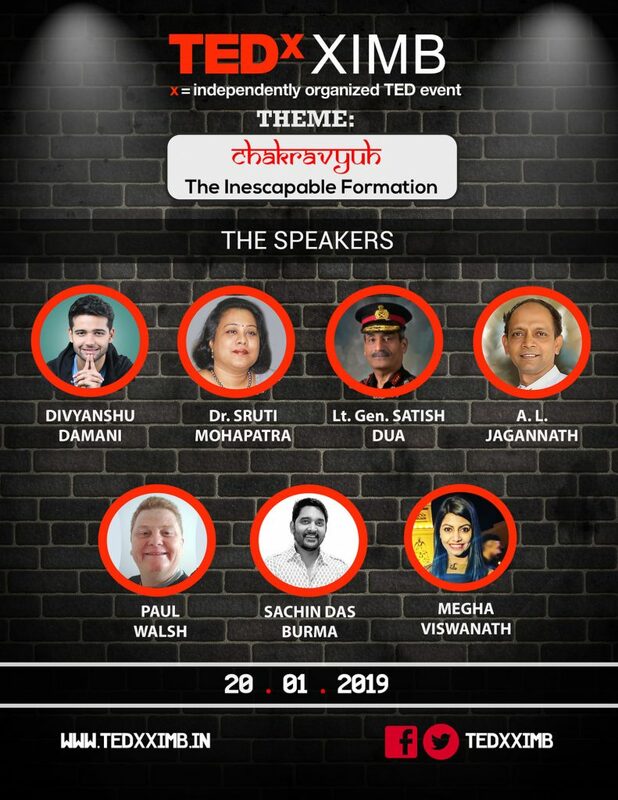 The nexus of all these eminent personalities is one simple thing: triumphing against unfavourable odds, and ultimately becoming the warriors who solved the vicious Chakravyuh of life. TEDxXIMB is honoured to host speakers of such high calibre. Stay tuned!